Gilbert Arenas is a millionaire and NBA superstar, but even he has been caught up in the Obama-mania sweeping parts of the country. Soon after Election Night, the Washington Wizards franchise player decided to show his support for President-elect Barack Obama by getting a political tattoo on his left hand. On Wednesday, Arenas showed off the tattoo to NBC4's Dan Hellie. Check out the picture above. 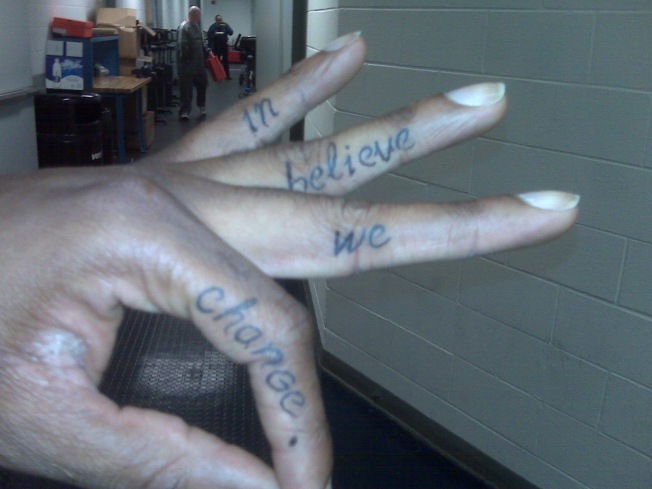 Arenas got the words "Change We Believe In," a variation of Obama's slogan "Change We Can Believe In," permanently placed on the fingers of his left hand. "He told me he got it so he could look at it during games and see the, 'We Believe,'" Hellie said. Arenas, who once called himself The Black President, told The Washington Post he got the tattoo from his favorite artist in Miami after the Wizards traveled to Orlando for a game.